The black and white photo made in the Mirabell Gardens in beautiful Salzburg, Austria is a great example of how to improve composition through symmetry. This photo, made in the grounds of the beautiful Mirabell Gardens in Salzburg, Austria is all about symmetry. Being full of texture, tonality and shape it was a standout for rendering into black and white. Removing the color from a photo is a very simple task in Adobe Lightroom or Photoshop. While just a small slice of the gardens this photo does, in some ways, represent the highly structured nature of the location. Ultimately this photo is about symmetry. You’ll notice the way many pairs of elements mirror each other on either side of the larger planter in the middle of the frame. For example the two curved stone shapes in the foreground and the two planters in the background. The relationship of these elements to each other is what gives this picture such a definite sense of order and balance. I’m not worried that the flowers on the right side of the frame are not mirrored on the left side. If they were the image might begin to look a little too perfect and, as a consequence, contrived. It's a photograph, after all, not a painting so I had no choice but to make the best of what was in front of me when I composed the image. That's one of the great challenges in photography which, more often than not, involves the process of making something out of nothing. I think the resulting space on the left side of the frame suggests an almost negative space. This encourages folks to quickly scan that area and then to move over to the flowers on the right hand side of the image for a more detailed exploration. 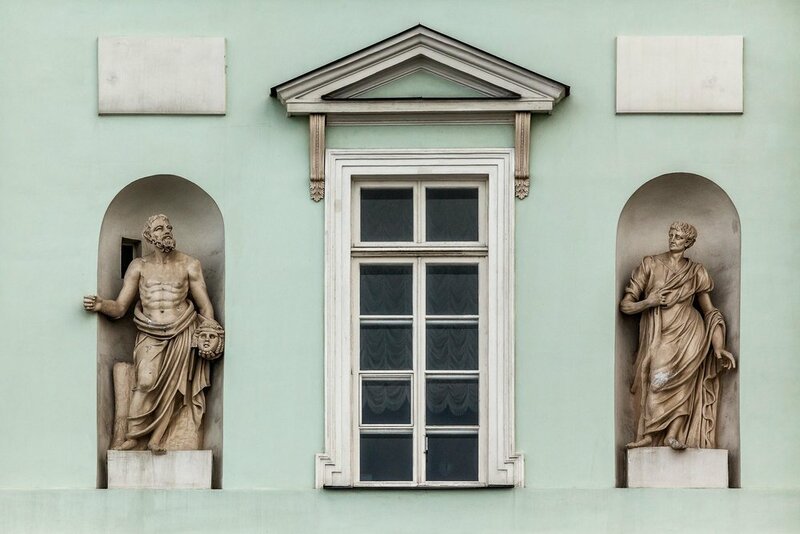 These two statues, on either side of a window, is just one of hundreds of fascinating sites from a canal cruise in St. Petersburg, Russia. This photo is composed very much around the notion of symmetry. It's important for the viewer to be able to find both rest and engagement within an image. You don't want to make the experience too challenging or too much work. The viewer needs to find reward for their exploration, and rest is a very valued reward. Is it not? I think this photo of two statues on the facade of a building in St. Petersburg, Russia demonstrates this notion very well. The fact that the wall is relatively smooth and painted in a cool color absolutely suggests areas of rest within the image. And, as negative space, does it not make the various objects, shapes, lines and textures within the image pop? A highly structured image, underpinned by formal compositonal concerns, on Huangshan (i.e., Yellow Mountain) in China. What Are Your Photos Really About? I think it’s worthwhile pointing out that photos can also be based around and be about composition. While this photo was made in the grounds of the Mirabell Gardens, it’s actually a study of composition. And symmetry is the underlying principal that underpins the composition within this photo. And why can’t even a simple photo of your cat, dog or budgie be underpinned by great composition? It may be what’s needed to elevate the picture from a mere snapshot to a great photo.